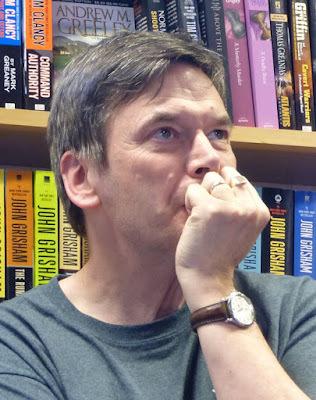 Ian Rankin at The Poisoned Pen! Saturday, January 30, was a beautiful day in the Valley of the Sun. Normally Denis would be working at the airport, but having just returned home from a week in the Bisbee area, he'd decided to take the day off in order to join me at our favorite bookstore, The Poisoned Pen, to see Ian Rankin. Denis and I have been going down to Bisbee for at least a decade to celebrate my birthday/our anniversary, and it always seems that The Poisoned Pen goes out of its way to schedule some choice authors when we're out of town. (After all, this is all about us, isn't it? *wink*) For once the stars aligned, and The Poisoned Pen's event calendar published before Denis had to bid for his time off. This is why Denis and I managed to go to Bisbee yet not miss Paige Shelton, Jenn McKinlay, Val McDermid, and Ian Rankin, all of whom made appearances during the crucial time frame. Sometimes I have the feeling that my other half thinks I'm silly for leaving so early for a Poisoned Pen event. I can't help it if I seem to want to sit in the most popular seat in the house! Regardless what he thought, I was determined to get there in plenty of time. 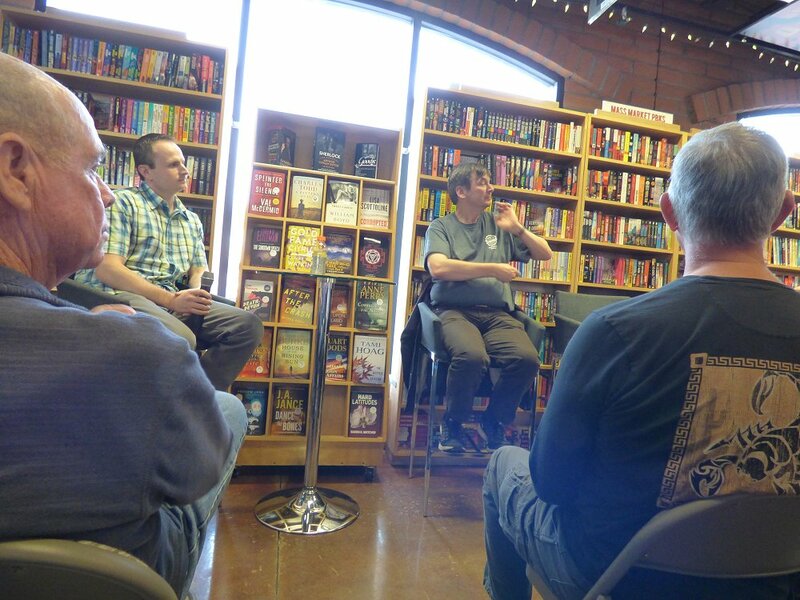 Not only is Rankin an extremely popular crime fiction writer, a staff member in the bookstore had told me she expected a crowd when he appeared. I'd barely made my purchase, reserved our seats, and sat down to read when other Ian Rankin fans began filing in the building. Denis looked over at me and said, "You were right." 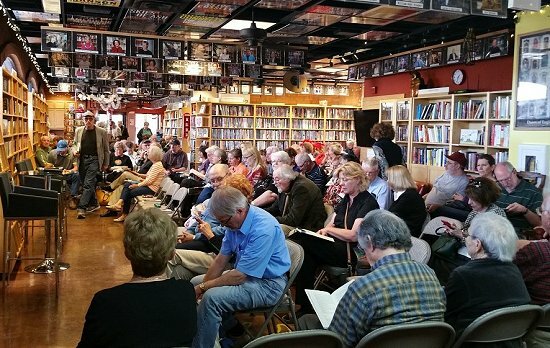 Bookstore owner and host Barbara Peters had a few opening remarks about upcoming events-- and the news that she's transferring ownership of the bookstore to the staff this year-- before the event began. One of the upcoming authors is one of three who have continued series written by the late Robert B. Parker. As interviewer and this year's Writer in Residence Michael Koryta said, "It takes a village!" 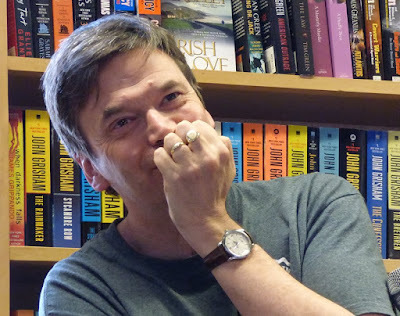 Ian Rankin and Barbara Peters have been friends since about 1990, and when asked how many times he had appeared at the bookstore, Rankin replied, "Tons of times. As long as you keep feeding me, I'll keep coming back. And sunshine! It's snowing in Edinburgh right now." Rankin had us smiling, but Koryta made us laugh with his first observation. "Five years ago you said you were going to retire, so.... What are you doing here?" "Are you talking about me, or Rebus?" Rankin replied with a grin. Talk almost immediately switched to how Rankin does what he does so well. His "writing implement" has to be one of the best grossing purchases of all time: a computer featuring Windows 95 and Word 97 that the author purchased for $400. He can't have any internet access and must sit facing a blank wall. (Can you tell he's easily distracted?) He bought a second home in Cromarty, north of Inverness, that has no internet, no cell phone reception, and no television. Up there he can crank out a first draft in ten days "because there's nothing else to do!" Koryta mentioned learning about Rankin's first book, a black comedy about a child with supernatural powers and a one-legged schizophrenic librarian. Seems to me there was something about a kidnapping, too. As intriguing as that first book sounds, Rankin assured us that it would never be published. 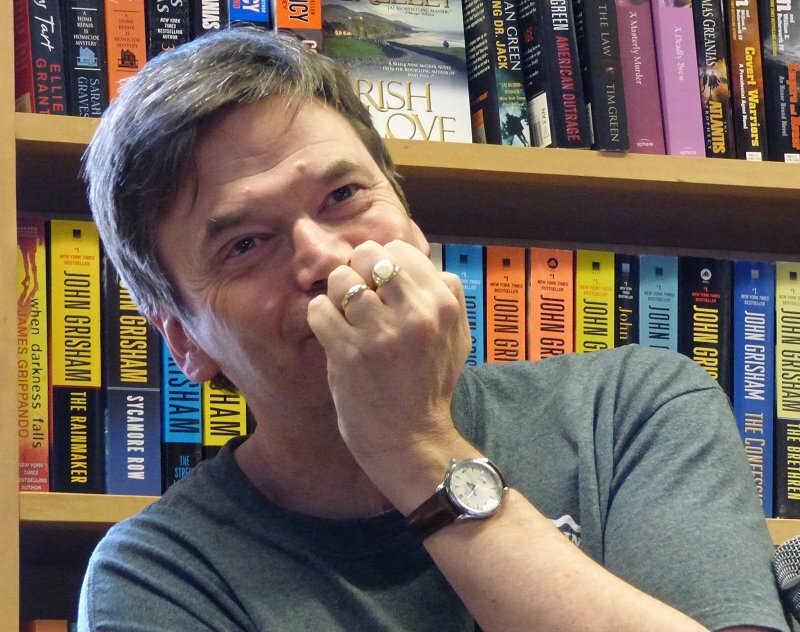 When Koryta mentioned the changes in Rebus's character throughout the series, Rankin smiled and said that someone had said, "Rebus is happier than I've ever seen him-- he smiled three times in this book!" When Rebus reached the mandatory retirement age for Scottish policemen, Rankin created a new character, Malcolm Fox. (I've heard people say that Scotland raised that mandatory retirement age just so Rebus could come back. I think some of them were serious!) Then Rankin had an idea for a book that concerned a cold case. This meant that Fox couldn't be the one to solve it, since he works Internal Affairs. Rankin had to bring Rebus back, and he was terrified. Had Rebus left him? After writing the very first page, Rankin realized that his character had never left, and Standing in Another Man's Grave became Rebus's comeback book. Rankin writes one book at a time. "Will it be a Rebus? I dunno. A Fox? I never know who it's going to be. It's not like I started out with A Is for Alibi and thought '26 more books'!" Recently Rankin has lost several friends who were only in their fifties. His close friend Iain Banks sent him an email to let him know he'd found out that he only had four months to live and had asked his girlfriend if she would be his widow. These losses have hit Rankin hard, and his wife told him to take a year off. Mentioning his "steam-powered, coke-fired" computer, Rankin told us that he's written 31 or 32 books. The first few books didn't sell well but were well-reviewed. At the time he and his family were living in France, and he was writing two books a year trying to make ends meet. His youngest son was born with special needs, and Rankin didn't know enough French to be able to talk with his son's doctor. All his pent-up rage and frustration were channeled into the book he was writing, Black and Blue. To Rankin, it was just another Rebus book, but it won the Crime Writers Association's Gold Dagger. "Remember your lows," Rankin told us. "Learn from your lows." Black and Blue and the next book The Hanging Garden were when everything fell into place in Rebus's world. Back in 1983-84 when Rankin was a university student, he was writing a book. Told to go to Leith to continue his research, Rankin was dressed more or less like a tramp when he met with two police detectives. The detectives took one look at him and weren't impressed. When Rankin explained that he was writing a book, the two asked him what it was about. It just so happened that the synopsis of his book mirrored a missing person case that those two detectives were investigating. Within minutes Rankin became a prime suspect. When he eventually made it back home and told his family what had happened, his father looked at him and said, "You silly bugger." An ex-cop walked up to Rankin at an event, and while Rankin was signing his book, the ex-cop said, "You know, you make quite a few procedural mistakes." Rankin looked at him and replied, "You want to know why? I can't get near you guys!" Then there was the time Rankin had gone out for a walk in the neighborhood and come across lots of police cars, emergency vehicles, and crime scene tape. He tweeted that he thought he'd just come across a murder-- and got in trouble because his tweet went out into the ether before anyone else (official) knew what was going on. The police were not pleased. And that's not the end of it. Rankin and his family had moved to a toney neighborhood in Edinburgh next to Alexander McCall Smith. Newspaper reporters had seen him at the murder scene he'd tweeted about, and the next day Smith met Rankin, holding up the newspaper with headlines that read "Ian Rankin Contaminates Crime Scene!" (Completely untrue by the way.) "You've been nothing but trouble ever since you moved here," Smith told Rankin. And should we even mention the woman in that same neighborhood who told Rankin that she didn't like having Cafferty the gangster (one of Rankin's characters) living on her street? "What? Was he bringing down her property values?" Rankin wondered. "Ian Rankin's Edinburgh" is an app available for download. You can use it to walk the streets of the city to see places the author has written about. "Yes... Ian Rankin's Edinburgh!" Michael Koryta said. "But there's also J.K. Rowling's Edinburgh and Alexander McCall Smith's Edinburgh and Kate Atkinson's Edinburgh," Rankin quickly said. "Edinburgh can hold multitudes." "If you start writing about the real world, the real world can bite you back," Rankin told us. "Procedures change. Rebus lives in real time. He retired when he had to, and he came back when he could." But the real world can imitate art. Rankin once added a footrail in a pub where a footrail did not exist. The pub owner has since installed one so his business matches its description in the books. Koryta's list of questions had come to an end, and topics began to change almost from one sentence to the next. Everyone packed into the bookstore was enthralled. When asked, Rankin told us that he's a month behind schedule on writing the next book-- simply because he can't write while he's on the road (and he envies those who can). Someone in the audience asked him which authors had influenced him, and whose books did he enjoy reading. Names began to pour out of Rankin's mouth. Scottish writer William McIlvanney was a huge influence on Rankin, particularly McIlvanney's Laidlaw trilogy. "Someone told me that Harry Bosch and John Rebus seem to be on parallel paths," Rankin said. "It's true. I don't know how it happened, but I like it." After commenting that the UK tends to be more blasé about terrorism than the US due to many years of the IRA, Rankin proceeded to tell us about the first instance of terrorism in Scotland. I'd read about it and heard Billy Connolly's version, and couldn't wait to hear Rankin's. Terrorists decided to drive a car filled with explosives into the Glasgow Airport. The car got stuck in the door, and the terrorists (who'd caught on fire) tried to make a run for it. The burning terrorists were summarily kicked to the ground by ordinary Scottish citizens. As Rankin said, "Welcome to Scotland!" According to the author, the man responsible for capturing the terrorists had 15,000 drinks paid for in his name at his local pub. "He had to move to America to avoid becoming an alcoholic," Rankin said. 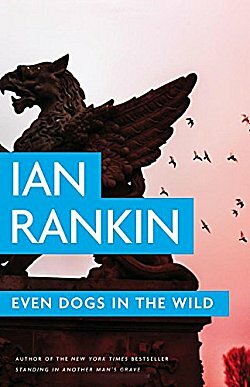 There have been one or two television versions of Rebus, and Rankin was not happy with the 45-minute-per-book treatments that were done. He has since got the rights to Rebus back, and he's looking for Scandinavian film makers who will do six hours per book instead of 45 minutes. I hope he finds them. Soon! Oh, rare treat there, Cathy! 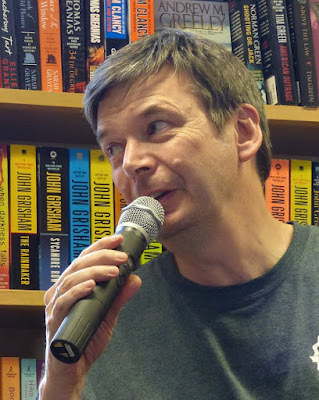 How very nice that you got to see Ian Rankin! Thanks for sharing it. Oh, and I love the 'Spot Cathy' photo that Denis took. Is that where you usually sit? Wonderful spot! How delightful! Wonderful summary of what sounds like a terrific evening, with the wit flying left and right. What is better than dry English, Scottish, Irish wit? And Rankin dispenses it well. This reminds me to go read more Rebus books.